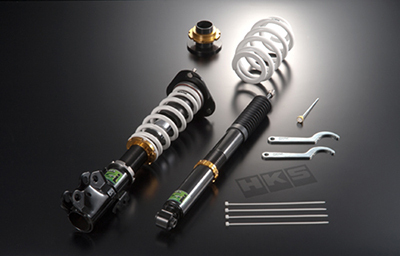 The "M-Shaft" which was designed for HKS HIPERMAX series' flagship model of "M1" is also utilized. Enlarged cylinder diameter optimizes the oil pressure's characteristics and maintains the dampening even at subtle stroke range. Especially the M-Shaft on rear side improves the ride quality. Linear progression piston adjusts oil passages for precise stroke management resulting in smoother valve movements. As piston speed increases, dampening rate linearly increases. Ride quality of city street driving can be improved. Durability is enhanced, and noise is reduced. * Some automobiles has options for pillow upper mount.